The Forus has an extendable cargo tray that can carry cycles. 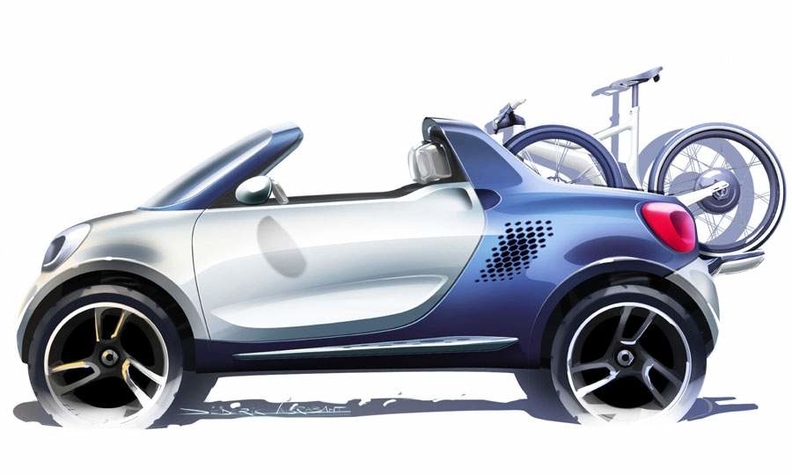 STUTTGART -- Smart has revealed a series of sketches depicting a compact, zero-emissions pickup concept that will make its public debut at next month's Detroit auto show. Called the Forus, a name chosen to indicate its suitability for the pickup-loving U.S. market, the electric-powered, two-seater was conceived as part of plans to extend the scope of the Smart lineup. It's unclear if the vehicle will be produced. Employing styling cues established on the smaller Smart Forvision concept revealed in September at the Frankfurt auto show, the Forus has an electrically powered cargo tray that extends to allow luggage such as bicycles to be carried. Traditional Smart elements include largely unadorned body panels and a two-tone color scheme. There's also a break from the brand's tradition, with borderline rugged elements to play up the pickup look. The Forus is substantially longer and higher than the existing Fortwo. Although Smart won't confirm it, various styling elements, along with the basic dimensions and newly developed platform of the Forus, are said to mirror those of the upcoming second-generation ForFour, which is being developed in partnership with Renault. The French carmaker will use the same platform as that planned for the ForFour to underpin its third-generation Twingo minicar. Secrecy surrounds where the platform will originate, but sources close to Smart parent company Mercedes-Benz suggest that it will be a development of the so-called A-platform found underneath the second-generation Twingo. Both cars will be produced in an existing Renault factory in Novo Mesto, Slovenia, beginning in 2014. Power for the new Smart concept comes from the same plug-in electric system used on the Smart Fortwo electric drive on sale in Europe. Smart's U.S. sales have dropped 16 percent to 4,498 units this year through November in an overall light vehicle market that has climbed 10 percent.